Are you looking to rent office space near Stockport? 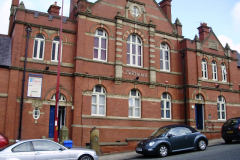 The Old courthouse is located on Chapel Street, Dukinfield right behind the Town Hall. Our business centre is a short 15 minute commute into Stockport town centre, at a fraction of the price of an office to rent in Stockport. Great access to local motorway networks and the M60 Manchester ring road makes the Old Courthouse a viable option for someone wanting to rent Offices near Stockport.